Immediately Etisalat changed their name to 9mobile, many people have been wondering if there is any change in the service that the company delivers. Many subscribers of this network have been wondering of their new data charges. After deep research I have found information that will clear your doubt and give answers to your questions. In this blog post I will be discussing in details much about 9mobile Data Plan, 9mobile Data Plan Code, 9 mobile Data Plan, 9mobile Data Plan 2018 and 9mobile Data Plan for Android. 9mobile is a Nigeria based network provider. The company has been in existence for over years now and they are doing fine. In Nigeria, they are known for their strong network and fast customer service delivery. Even though people say that the company’s services are costly, truly it is compared to other service providers in the country (MTN, Glo, and Airtel). What questions will this article answer? · What is 9mobile data plan code ? · What is 9mobile data plan codes? · What is 9mobile data plan for android ? 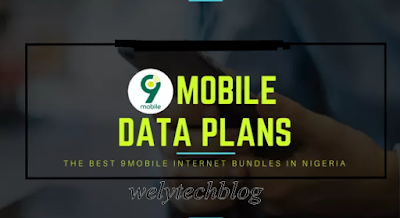 · What is 9mobile data plan 2018 ? · What is 9mobile data code? · What is 9mobile data bundle ? · how to buy data on 9mobile ? · What is etisalat data plan code? So I advise you to read this word by word not to miss anything.. The following are list of 9mobile Data Plan with subscription codes as released by the company as of 2018. They offer 20MB for NGN 50, to enjoy this plan dial *229*3*8# or simply send MI3 to 299. The given data is valid for a day. Second available option in daily data plan is NGN 100 for 40MB. For onr to subscribe to this plan kindly dial *229*3*1# or send SMS MI1 to 299 to subscribe. The given data is valid for 24 hours after that it is void. There is only one available data plan option offered by 9mobile in weekly basis. That’s 150MB for NGN 200. For one to subscribe, dial *229*2*10# or send LCD to 299. Given date duration is only for 7 days. 500MB for NGN 500 dial *229*2*12# or send LCD2 to 229 to subscribe. This data lasts for 30 days or one month. 1GB for NGN 1000; dial *229*287# to subscribe. This data lasts for 30 days or one month. 1.5 GB for NGN 1,200, for one to enjoy this data plan kindly dial *229*2*25# or send AND11 to 229. This data lasts for 30 days or one month. 2.5GB for NGN 2,000, to subscribe dial *229*2*8# or send AND2 to 229. This data lasts for 30 days or one month. 4GB for NGN 3,000, dial *229*2*35# to enjoy this service. This data lasts for 30 days or one month. 5.5GB for NGN 4,000, dial *229*2*9# to subscribe to this service. This data lasts for 30 days or one month. 11.5GB for NGN 8,000, to subscribe for this service dial *229*2*5# or send MB6 to 229. This data lasts for 30 days or one month. 1GB for NGN 500; this data plan is used for weekend that is from Friday 11:59pm to Sunday 11:59pm. To subscribe dial *5995*2#. There is no duration for this data plan, you use it every weekend till it finishes and it can’t be used outside weekend days or working days. NGN 200 for 1GB Night plan to enjoy dial *229*3*12#. Data plan duration is from 12am to 5am each day of subscription. NGN 1,000 for 2GB dial *229*3*12# to subscribe. The data given in this plan is used on evening and weekend. NGN 2,000 for 5GB to subscribe dial *229*3*13#. This is weekend and evening plans and it comes with 100MB for whatsapp data available for usage 24 hours. This is valid for 30 days or one month. Auto renewal is simply automatic subscription. This happens when you the duration of your data have expired. The company (9mobile) will subscribe you to that plan by themselves, without seeking for your permission. Provided that you have enough airtime or money equal the data plan platform. Can I Get Rigid of This? If you have subscribed to any 9mobile Data Plan to cancel auto renewal simply dial *229*0#. Have You Subscribed Wondering How to Check your Data Balance? Oya let’s do it together. For one to check 9mobile data balance is very simply. Dial *228# to check you data balance. I must say 9mobile is a reliable network provider company in Nigeria so far with strong network and efficient service delivery. Even though that 9mobile Data Plan is very costly compared it competitors but it worth it. If you are working for a company and need not to be disappoint on internet connection. 9mobie is super best for you, try their services and testify like me. Do you feel we are missing anything; the comment box is available for you to ask your questions and say your mind. Click on the share button if this article worth it, Keep visiting my blog for more.